Zoning: Zoned Commercial-District: Permitted uses include general retail, service, business and professional offices, etc. Multi-Tenant Building — Available: 800+/- sq. 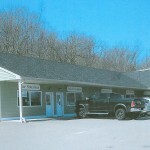 ft. Retail Space (1st Floor) for lease @ $1,400.00/Monthly plus Utilities; 600+/- sq. ft. Open Office Space (2nd Floor) for lease @ $550.00/Monthly plus Utilities. FEATURES: Excellent location on Route 28 with easy access to Interstate Route 93. ACCESS: Via Interstate Route 93, Exit-3. Proceed east on Route 111 approximately 2-miles, turn right onto Route 28, and proceed to the property on the right. ZONED Commercial-District: Permitted uses include general retail, service, business and professional offices, etc.